20cm x 20cm filter pads made for 20x20 plate filters. 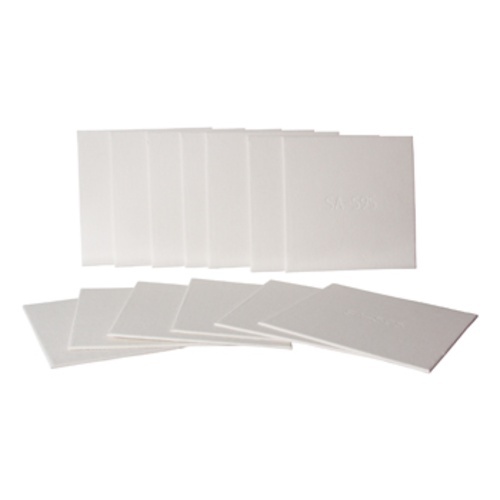 9-10 micron pads are considered to be a "very rough" filtration and are typically used to prepare the wine to be filtered by finer pads, usually either 5-7 micron; or also to pre-filter white musts prior to fermentation. Please note that all pad filters are rated 'nominal', meaning that about 90-95% of all particulate matter at the micron rating will be filtered out. There will always be a little bit of smaller material that is also filtered out, as well as some larger material that will make it through. Because the 2-3 Micron sheets plug in about 2 seconds on beer.